Against Plzeň, the coach Karel Stanner used the exact same team as in Olomouc. After this year's first win achieved in the Haná region, he adhered to the old football axiom that a winning team should not be changed. The seasoned players like Kulič, Kúdela, Poláček, Opiela, Miller and junior Bořil stayed sitting on the bench. The players played an interesting game. First and foremost, the Mladá Boleslav team, motivated by defeating Olomouc, played with great excitement. And the spectators enjoyed not only many chances to score, but a really fine display of football. In minute 23, Táborský showed a beautiful trick, having shot by a perfect overhead kick aimed near the right goal post after a smart chipped kick by Mendy - 1:0. The Plzeň team did not play defensively, but their attacks were not as dangerous as the Mladá Boleslav ones. In minute 37, Zahustel got the ball to Kalina on a run, who was tripped by Lecjaks in the penalty area. The referee ordered a penalty kick, converted by Sylvestre - 2:0. The joyous festival of football put on by Mladá Boleslav continued in the second half too. Plzeň did not want to submit and tried tirelessly to match the rival's goal. The Mladá Boleslav defense, supported by the goalkeeper Šeda, did not make any fatal error and resisted. In the last quarter of an hour, the Mladá Boleslav players improved their well-deserved win by two more goals. In minute 77, Sedláček scored his first extra-league goal, after a chance set up selflessly by Zahustel - 3:0. 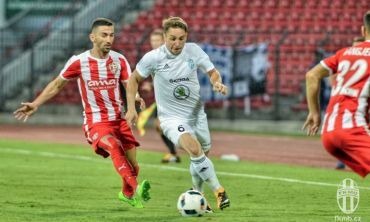 In the last seconds of the match, when the referee added two minutes, Poláček took a shot at the right goal post after a pass from Kulič - 4:0. The match drew to a close with rhythmic applause from the satisfied Mladá Boleslav spectators. FK Mladá Boleslav team: Šeda - Kalina, Procházka, Rolko, Hrdlička - Zahustel, Mendy (Kúdela 71), Sylvestre, Sedláček (Poláček 82) - Chramosta, Táborský (Kulič 61). FC Viktoria Plzeň team: Daněk - Ševinský, Navrátil, Bystroň, Lecjaks (Jiráček 42) - Petržela, Horváth, Rada (Hájovský 78), Rajtoral - Rezek (Kolář 46), Bakoš.